The time flies when you’re having fun! We are now over half way through with Fall Term at Oregon State University. It is an exciting time here in the shop as the seniors begin to finalize their designs and prepare to manufacture new parts during the upcoming Winter Term. But it isn’t all work without any play. Many members of the team were able to attend a test drive day in McMinnville, OR at Northwest UAV Propulsion Systems during the last weekend of October. Although it was a typical fall day in the Willamette Valley, the rain did not deter us from getting out there and driving the car. 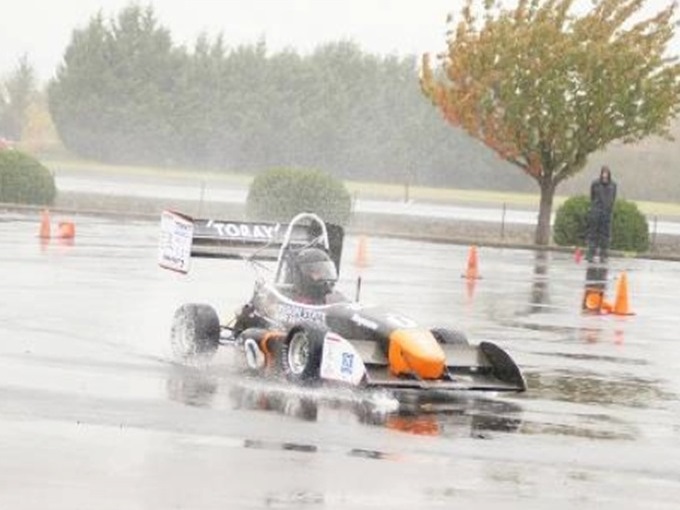 It was a great learning experience for the drivers on how to handle the car in variable conditions. The drive day in McMinnville prepared GFR for the following weekend for the annual Dallesport Shootout, where six teams from the Pacific Northwest met at the Columbia Gorge Regional Airport in Dallesport, Washington for a collaborative test weekend. The shootout brings the different teams close together to talk engineering, build camaraderie and speculate about the upcoming season. Having driven the car twice this early in the season will pay benefits later. We at GFR are continuing to make progress on design and manufacturing portions of the season and look forward to begin piecing the car together in the coming months. This is a very busy and thrilling time as we move throughout the season.